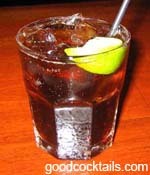 Pour the rum into a glass with ice and fill it with cola. Squeeze the lime wedge and drop it into the glass. Don't forget to squeeze the lime wedge and drop it into the glass. Otherwise you have a rum and cola.